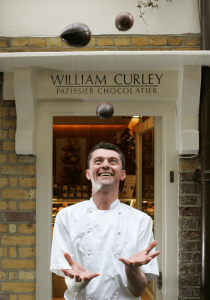 We are delighted to announce that we have joined forces with the country’s foremost patissier and chocolatier, William Curley, to create a chocolate collection available exclusively at our venues and events. The partnership will see Searcys and William Curley present a series of chocolate tastings and masterclasses, as well as launching specially created flavours inspired by, and exclusively available at, their prestigious St Pancras venues. Set to launch at St Pancras Brasserie and Champagne Bar in late September, this bespoke collection will feature a new trio of ‘Richmond Honey’, a light and very pure ganache ‘Yuzu’, a burst of aromatic citrus and ‘Toasted Sesame’, full of warming malt and nut flavours. These exciting new chocolates will be paired with the monthly Champagne trio tasting at the St Pancras Champagne Bar, or also served with coffee or tea, as the perfect way to end a meal at the St Pancras Brasserie. The collection will also be available as part of Searcys extensive conference and events packages. On Wednesday 19th September SquareMeal will see Searcys and William Curley collaborate to offer three chocolate tastings and a short masterclass, designed to give insight into the world of chocolate as well as an understanding of the skills and evolution behind William Curley’s favourite chocolate confections.